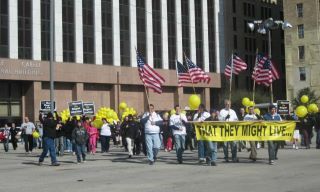 Around 8,000 pro-life advocates marched on Saturday January 21, 2012 in Downtown Dallas to have a rally outside the Earle Cabell Federal Courthouse housing the district court where Roe vs. Wade was first filed. Marchers and participants remembered the 39th anniversary of the U.S. Supreme Court's tragic Roe v. Wade decision of January 22, 1973, legalizing abortion in America and leading to the death of over 52 million unborn children. 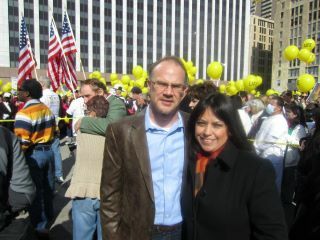 Representing VOCES Action, my husband Dr. Daryl Boyne and I participated in this March and spoke with many members of the Hispanic Community, explaining the sanctity of Life. We explained that the Constitution is very clear when it guarantees a right to life. VOCES Action explained that there is hope for those women who have had an abortion and for those who have encouraged or referred others to have an abortion (girlfriend, wife, daughter, friend, client, etc.). God is a God of forgiveness. Women do regret abortion, men regret lost fatherhood, and people regret referring women for an abortion. It’s a baby, not a choice! The event was sponsored by Texans for Life Coalition, Catholic Pro-life committee of North Texas, and Catholics Respect Life of Fort Worth. Among the speakers at the rally was Norma McCorvey, better known by the legal pseudonym "Jane Roe". Norma was the plaintiff in the landmark American lawsuit Roe v. Wade in 1973. The U.S. Supreme Court overturned individual states' laws against abortion by ruling them unconstitutional. 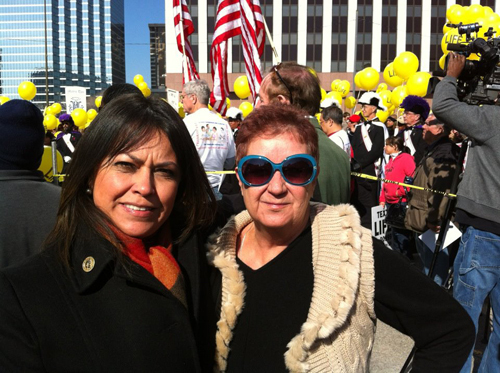 Years later, Norma converted to Christianity and she is now a prolife activist and heads RoeNoMore Ministry. I spoke with Norma thanking her for being there, and she hugged me and said with God all things are possible, including forgiveness and turning things around. She also told the media: "Anything in life is possible. I mean, if they can take a complete heathen like I was and turn me into a Christian and put a new song in my mouth, then Roe can be overturned." 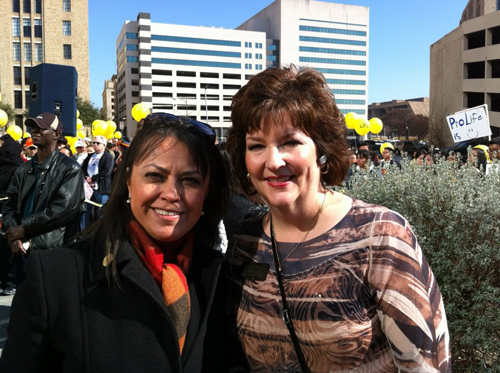 Kyleen Wright, President of Texans for Life Coaliton was there as always standing for the right to Life. Her non profit organization was a sponsor. Kyleen has been very helpful to me with regards to the Sonogram Bill in Texas, as I communicate about this bill to the Spanish Speaking community on panels and through the media. Another speaker was Ramona Trevino, a beautiful Hispanic woman who used to be a manager of a Planned Parenthood facility and gave referrals for abortions during three years. Ramona is pregnant and gave a speech including a Spanish message. Ramona got pregnant as a teenager and introduced me to her teenage daughter. She knew that the life of a baby was important, but her heart was hardened. She knew inside her heart, abortions were wrong, but resisted to leave her job at Planned Parenthood since that would mean losing half her family’s income. Ramona took a step of faith in leaving Planned Parenthood last May the 6th with the power of prayer, as people prayed outside of Planned Parenthood. Ramona's change of heart was after she read “unPLANNED”, the book by Abby Johnson. You can hear Ramona's testimony here in beginning at minute 6:27. Other speakers at the event were Bishop Kevin Farrell, Dr. Barry Creamer of Criswell College and Lisa Luby Ryan.